To transform the historic Railyard into a sustainable and inviting public space for recreational, social, artistic, and commercial activities in a way that embraces Santa Fe’s cultural and historical significance and upholds the community’s vision. When the City of Santa Fe purchased 50 acres of underused land along Guadalupe Street and Cerrillos Road and further south near Baca Street, its citizens came together to plan the future of the Railyard and decided on developing a vibrant new urban space that would serve all Santa Feans, celebrating their history, arts, recreation, landscape and environment. The Railyard Master Plan grew out of many years of discussion and planning. The Santa Fe Railyard Community Corporation (SFRCC) is a non-profit organization responsible for the implementation of that Railyard Master Plan and has worked closely with The Trust for Public Land and for profit and not-for-profit entities to develop this community asset with the support of the City of Santa Fe, the State of New Mexico, and the Governor’s Economic Development Initiative. With the revitalization of the Railyard nearly complete, existing studios, galleries, museums and community organizations are now joined by a year-round structure for the Santa Fe Farmers Market, a brand new home for teen center Warehouse 21, dynamic new retail and restaurant spaces in the new Market Station complex, live-in artist studios, and the addition of a state-of-the-art 12-screen movie theatre. More than 13 acres of open space have been created including a park, plaza and pedestrian promenade where water-harvesting and other environmentally innovative systems are in use. A trail for pedestrians and cyclists now runs the length of The Railyard from Montezuma to the south end of the Park. Commuter train service has begun with the New Mexico Railrunner Express arriving and debarking regularly from the historic depot, along with Santa Fe Southern’s popular excursion trains. 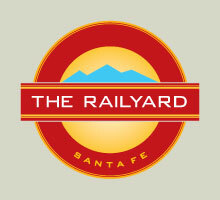 The SFRCC continues to ensure that The Railyard serves Santa Fe according to The Railyard Master Plans original vision through its continuing work overseeing remaining design and construction, managing the tenant leases and the permitting and use of all the public open spaces in The Railyard.